Good: Lot's of different playstyles possible. Bad: Not alot of players at the moment, so you mostly play with NPC's. Guns, missiles, destruction and cars. 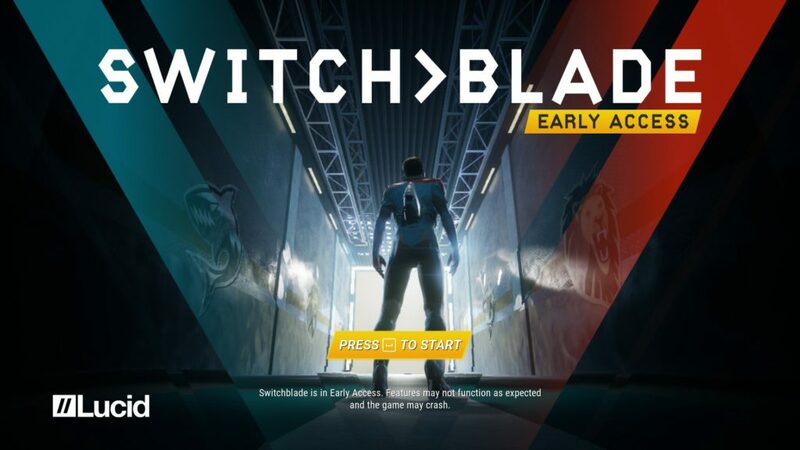 These are just four words in which you can describe the newest game from Lucid Games ltd. After their highly addictive android game ‘Geometry Wars 3’ they stepped up their game with their PC game ‘Switchblade’. With a lot of 5v5 arena games, they knew they had to come up with something unique to stand out in the field and get noticed. By implementing certain elements from other games and giving them a unique twist, they’ve created a game that you can’t play just for one match. Story wise, there isn’t that much to say about ‘Switchblade’. 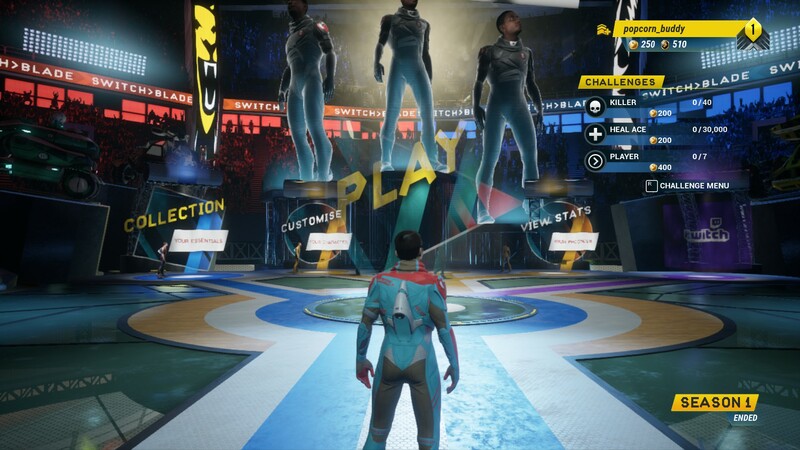 As soon as you start up the game, you enter a Hub-like area where all the other players walk around like NPC players. We would like to imagine that you’ve set out to be the best rider in the world. You can accomplish this by hard training and lots of practice. The graphics of the game are as good as you want. When you put everything on high, it’s a well-made game that’s soothing to the eye. While it’s beautiful on the highest setting, it also takes a lot of effort from your GPU. The best way to play it, if you don’t have a powerful GPU, is to play everything on medium. That way you’ll have a smooth gaming experience while also maintaining the beauty of the game. There is an option to play this game on the lowest of lowest settings, but then you’ll feel like you’re in a sandbox game, which this game doesn’t deserve. The pros of the lower settings are that the framerate shoots up, which makes the gameplay superfluid. The sound is upbeat and hypes you up as the game starts. You’ll have to press the space bar to get into the hub area as soon as you touch the space bar, a loud clapping and screaming noise comes into the music. This makes you as the player, even as just a beginner, feel like a champion. This feeling gets repeated every time you start up the game. This helps in building confidence and eagers you to get into your first battle. 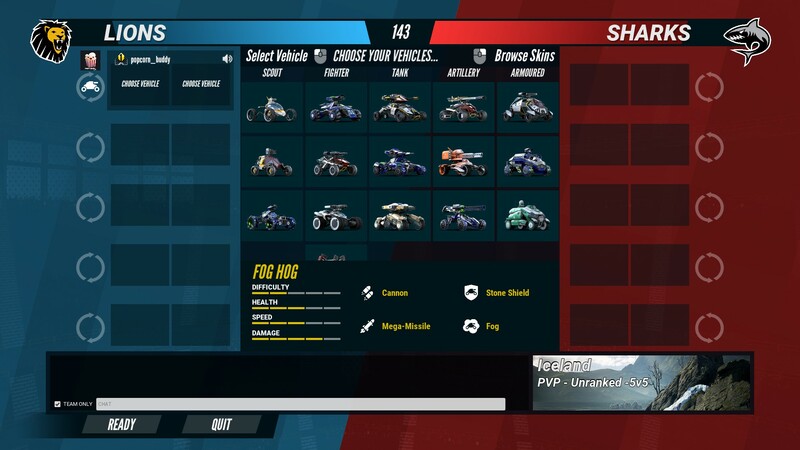 Switchblade is an arena-based 5v5 vehicular shooter which also blends some MOBA elements into it. The funny thing about the name Switchblade is that half of it is a major gameplay mechanic while the other part of the name doesn’t even appear in the game at all. The blade is nowhere to be seen but the switching part is what makes this game so interesting and versatile. It all starts with the choosing of the two cars you use during the game of 20 minutes. There are four types of cars. You’ve got the small cars that are very fast, but lack damage output and have low hp. These are perfect to catch up on other rivals. But be careful since it doesn’t take a lot of hits for you to die. The opposite type of car is the tank. These slow cars have a big health pool and are mostly used as shield from the opponents, but also as healers or buffers since their damage output isn’t that great. The other two cars are the damage output guys. You’ve got two options here. The first one is the all-rounder wit consistent damage output. 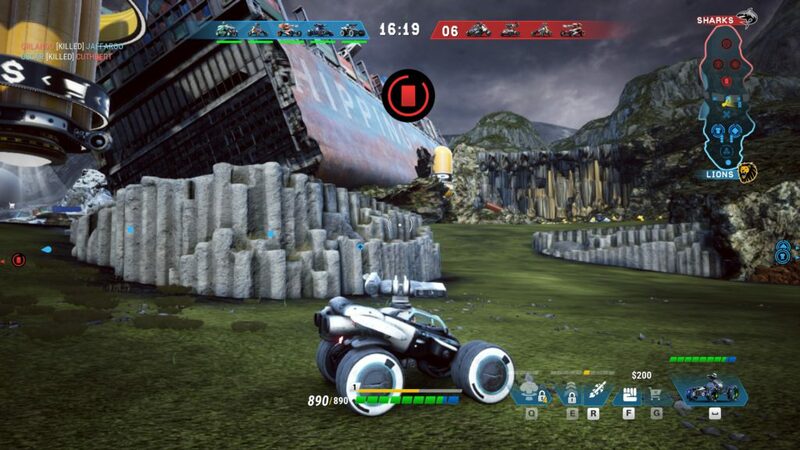 By using rockets and machine guns, you can take out rivals out in no time. The other one is the type of car with the highest damage output possible. These are mostly equipped with sniper rifles and are used to control the battle from the sides of the battlefield. Now about the controls of the game. You need to use the WASD/ZQSD keys for controlling your vehicle, which seems like every other game. For aiming you need to use the mouse and the left mouse button to shoot and the right mouse button to zoom in. you can use your skill points to earn new weapons. These are activated with the QER keys or if you’re using the AZERTY keyboard, the AER keys. These will be the buttons that you will feel very at home with since these are commonly used in many pc games. Now we move on to the buttons and which you will not be used to. When you earned enough experience and level up, you can use the acquired skill points one the weapon upgrades by pressing the CTRL button. Now this isn’t impossible to do while playing the game, but it does take a little look when searching for it. Now after playing for a while, you’ll find it easy to press it during the game. There is a second upgrade store for permanent upgrades to your vehicle, these can be accessed at two moments in the game. The first time you access this will probably be after the first time you get killed. You get sent back to the waiting area where you can access this menu by pressing V. This, again not used a lot in other games, gets easier while playing the game for a while. For the main game seller, the switching part. This game gives you the option to create a unique playstyle since the options are endless. By pressing the space bar during the game, you’ll switch out the two vehicles that you chose before the match. One thing to notice and that you do have to keep in mind is that the further away you are from your home base, the longer it takes to switch. This could be quite difficult to survive since you can’t move the vehicle when you summoned the other car. Keep in mind that you can still shoot to defend yourself so it’s wise to place yourself in a place that they can’t get to you while switching. 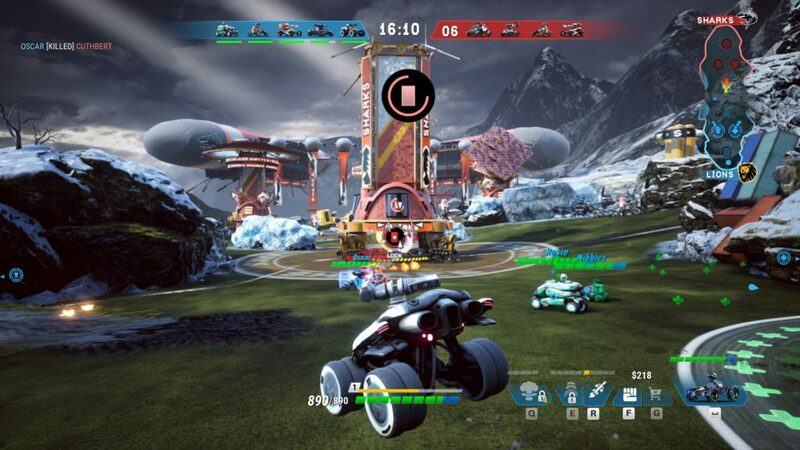 Switchblade is a very fun arena-based 5v5 vehicular shooter which gives you the option to play the game like you want it. Get to know the different types of cars and you’ll be rising to the top in no time. Find that little sweet spot and tactics but don’t be afraid to try something new. It’s a refreshing game to play after all the other 5v5 arena games and it’s certainly a game worth of putting time in. While there’s only one map now, more will surface after some time. Part time gamer with a passion for every genre. Adventure/horror are the faves but not too late at night. Likes gaming but love to help other find the best ones. Muse Dash – Announced for Switch and PC!